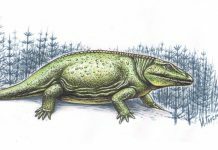 Colosteus is an extinct amphibian that was discovered during the late 19th century in Saline Township, Ohio. It was described in 1856 by John Strong Newberry and named by Edward Drinker Cope in 1862. 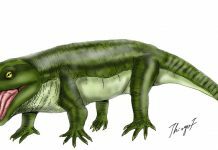 If you look at Colosteus pictures, you’d probably mistake it for a reptile. However, it isn’t one. 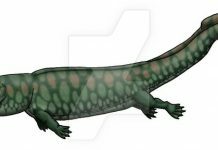 It is actually an extinct colosteid tetrapod that lived approximately 313-304 million years ago – during the late Carboniferous period. A fascinating fact from all of the interesting facts about Colosteus was that it is presumed to be a Piscivore. That means that it most likely lived off of fish. It also may have been carnivorous – eating small animals. Although, to prove this point more fossils would have to be found. 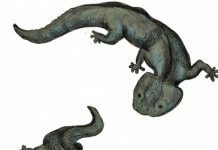 At the moment, only a skull and some partial fossils of this animal has been found. 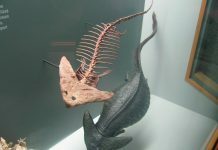 Colosteus could reach about 3 feet in length and weigh as much 15 pounds. This amphibian was heavily scaled, had a head that was pointed and somewhat flat, had really small legs and 2 premaxilla tusks.